Roman Reigns has been tapped to supplant John Cena as the top star in WWE. That plan didn’t work out this year, but they’re going to try again in 2016. Reigns has been fighting an uphill battle with this endeavor, not only because the modern audience doesn’t want to be told who to cheer for, but because Vince McMahon wants him to be another version of John Cena. Hulk Hogan, Steve Austin, The Rock, and John Cena are stars who were positioned as the main attraction and each are completely different from the other. Cena has been on top for 10 years. If you’re going in a new direction with a different wrestler, why would you want 10 more years of the same thing? Vince has either forgotten this or, perhaps, the company’s current ideology is so entrenched with the notion that a Cena-esque protagonist is what’s best for business. It’s certainty looks good on a poster, however, it doesn’t make for good television, which is the heart of WWE’s business and has been reflected in the ratings as of late. The carnage and bravado displayed inside of Boston’s TD Garden is the kind of badassery that fans have wanted to see from Reigns since The Shield disbanded. WWE has a poor, a ridiculously poor, track record when it comes to starting things off with a bang, only to muck it up beyond repair. Hopefully this is the start of a new character arc for Roman Reigns and not just a one-off moment where he returns to his regularly scheduled programming of smiling and telling bad jokes. CM Punk’s pipe bomb promo and Rowdy Roddy Piper smashing a coconut over the head of Jimmy Snuka are two prime examples of a defining moment that set a wrestler apart from everyone else. 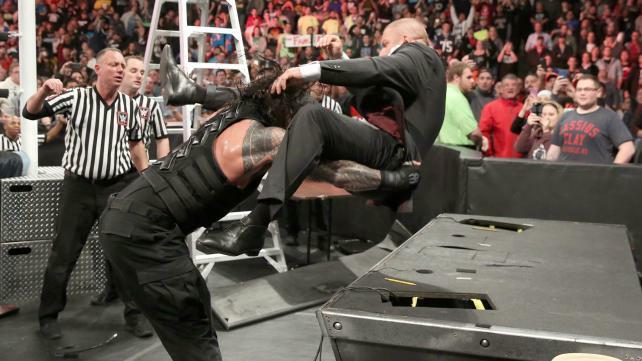 The post-match angle was well executed and could be the first brick in what could be a glorious Roman Empire.